Celebrity weddings are the next big thing in India, where not only the groom and bride and their family but also their millions of fans come together to bless the couple and be a part of their wedding celebrations. DeepVeer wedding is the brand new addition to the lot and while a huge part of the entire thing was kept under the curtain for a long time, the official photos are out. 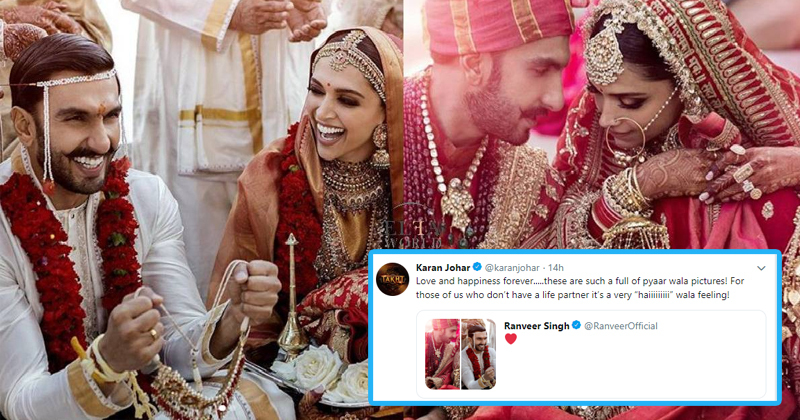 Deepika Padukone and Ranveer Singh, along with Sabyasachi, who is the designer of their wedding attire, posted pictures of these two beautiful souls uniting for the holy matrimony. They not only looked absolutely gorgeous on one of the biggest days of their lives but also looked spectacularly in love. The huge grin that the two carried on their faces, in the photos, can only come from true love and one can certainly feel it among these two. DeepVeer wedding was, in fact, one of the most anticipated events of the year that millions of fans were eagerly waiting for. The wait continues when the two boarded flights to Lake Como, Italy for their wedding week and even after they officially got married. But as they say, the fruit of patience is always sweet and the same happened here. The couple tied the knot in a Konkani style wedding and in a Sindhi style wedding, respecting the two cultures that they come from. Here are some of the pictures from the DeepVeer wedding. 1. Just look at the huge smile on their face and the love in their eyes. 2. These two are the cutest of them all. 3. Here is how lit the groom’s house back in Mumbai, is. Stunning! @ranveersingh’s Mumbai residence is all lit up at the #DeepVeerWedding. Here’s waiting for the bride and groom to return to the city soon. Many of the couple’s friends from the industry wished them on their union on social media and each and every message had something funny and amazing to add to their equation. Here are some of the congratulations aimed at DeepVeer Wedding. 1. Anushka Sharma welcomes the newlywed couple to the club. 2. Parineeti Chopra entering the ball with her own cute names for the two. 3. Ayushmann Khurrana is not behind. 4. Sushmita Sen is also here. 5. Karan Johar is a dear friend of the two and his wishes say the same. As the DeepVeer Wedding in Lake Como, Italy comes to an end, we can’t wait for the two to come back to the country and have receptions to enjoy their union with their friends and family in India and from the film industry. We wish you two, Deepika Padukone and Ranveer Singh, a happy and wonderful wedding life.